The Best Double Camping Cot - Top 5 Reviewed! Home » The Best Double Camping Cot – Top 5 Reviewed! The Best Double Camping Cot – Top 5 Reviewed! The Best Double Camping Cot – Top 5 Reviewed! – In my younger hiking and camping days a good sleeping bag and a hard floor were all I required, but now I seek comfort over convenience as my back needs a good surface for sleeping on. Below are my final 5 fully researched and personally tested double camping cots. These are, in my opinion, the best choices on the market today with regards to comfort, mobility, ease of set up and price. So which two-person camping cot to buy? The correct term for the outdoorsman is cot and I’ve been trying out some of these as well as talking to fellow enthusiasts about their experiences. We whittled the list down to five double camping cots for two. I then borrowed an example of each and, along with my wife, took it out into the great outdoors to test its true mettle. 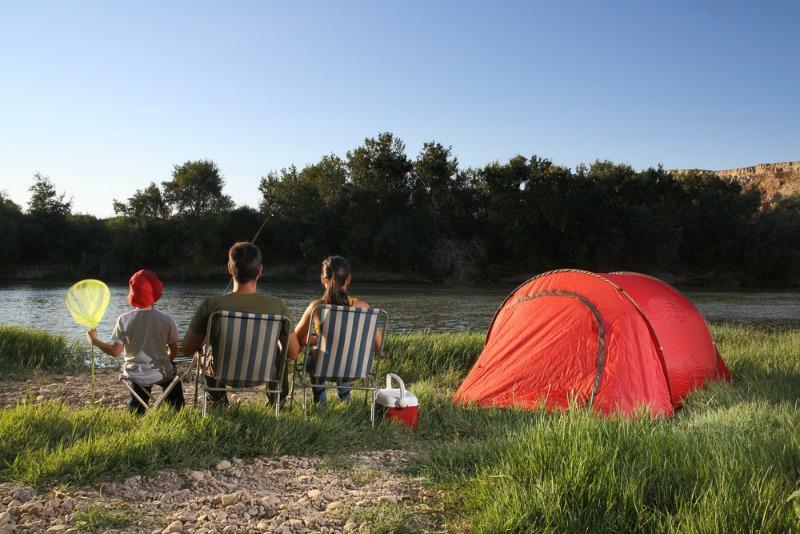 To avoid repetition, there are matters common to all five camping beds for two listed here. I can state emphatically that all the double camping cots score highly in the comfort stakes. They may need some extra padding here and there, but a good night’s sleep is virtually guaranteed. All the double camping cots are long enough to meet the demands of the tall, and sturdy enough for the heavy. In order to help you with your purchasing decision, I have paid particular attention to comfort, overall durability, the noisiness of the frame, how easy it is to set up and take. When setting up the first thing the camper notices in this Coleman Airbed Cot is its weight. Even compared to the other heavyweight double camping cots this one packs a punch in the gravity department. Coleman concedes this and so thoughtfully provide wheels on the carry case to ease that car-to-tent leg of your journey. The set up was easy. I was delighted to see there was a side table on each side of the bed. That’s right, a kind of bedside table. This is a rather civilized home comfort. After all, side tables are useful for all sorts of things especially a mobile phone. It also has a drink holder. 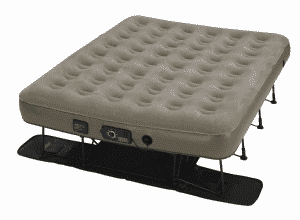 The air mattress is filled up by the use of a battery pump. Though the nozzle and hole was not a snug fit, it was still easy and quick to get the mattress inflated. It would be a good idea to have spare batteries, I wouldn’t want to blow the mattress up with my lungs. Some people like a dizzy, light-headed feeling but I don’t. The mattress is zipped into place to avoid movement in the night and, when the time is right, can be replaced. A bed is not really a bed unless it is elevated off the ground. This makes the camper feel even more at home. Moreover, there’s a lot of space underneath to store your important camping gear unlike at home where it tends to be useless stuff that you will never use and can’t bring round to throwing away. The height also makes it easy to get in and out of and that is handy in its role as a guest bed. When striking camp this 2 person camping cot proved easy to disassemble and put back into its wheeled case. This operation does, of course, need to be done with care, skill and a memory of how it was packed in the first place. The mattress has to be completely deflated. The carry case does seem a bit flimsy and the zips bear a lot of tension and this made me wonder how it will perform in the long term. There is one slightly annoying problem. The Coleman Airbed Cot can be a little bit noisy. When rolling over or getting up the material rubs off the frame and causes some friction noise. A slight bugbear, but not a dealbreaker. 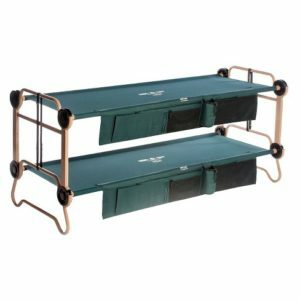 This camping cot for two is unique in this list in that it is a pair of bunk beds. This vertical sleeping storage requires a higher than usual tent and has a slightly military look about it. Though bunk beds are normally associated with childhood, the proportions of the Disc-O-Bed Large cater for the adult world. It’s perfect for married couples going through a rough patch. Bunk beds create space in the tent, enabling campers to do those in-tent activities such as… er.. well doing stuff. As with most bunk beds, they can be separated to use as two singles. These sit rather low on the ground so getting in and out may be awkward for those less sprightly campers among us. Setting up is easy and logical. The poles slide through holes in the canvass and are positioned into discs and these snap into place. The discs are, I presume, what gives the Disc-O-Bed its name. Perhaps I should make it clear, it’s nothing to do with disco music. To access the latest Amazon prices Click Here. This is good camping cot for two adults. The company is called Kamp-Rite and it does all the basic things right. The cot itself is called a Kwik-Cot and, true to its name, it’s quick to put up. It’s sturdy and comfortable. The construction is solid and the sturdiness is derived from the fact that the weight of the sleeping camper is distributed over nine legs. Being well elevated affords capacious storage space underneath. There is a support bar down the center of the cot which can be a source of discomfort so you may wish to have an air mattress to cover it. 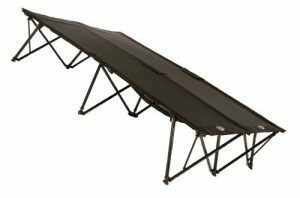 The Kamp-Rite Tent Cot Double Kwik-Cot is essentially a mattress stand and this should be born in mind when comparing prices. Mattress-free camping means there is less to carry around. There are no pumps and batteries and pitching camp is that much quicker and easier. Instead of a mattress, sleepers are supported by a thick canvas. This remains strong and doesn’t sag. It is also quiet. This is an important issue for campers. If you are prone to tossing and turning at night, you’ll be gratified to know that the Kamp-Rite Tent Cot Double Kwik-Cot, with its sturdy manufacture, is remarkably free from squeaks and squawks that can keep heavy sleepers awake and drive light sleepers to distraction. But the central bar, with a callous disregard for romantic inclinations, sticks out to separate the two sleepers. This is a double camping bed with a difference. It almost managed to slip out of the top five by being of an ambiguous category. It says ‘tent’ in the name and picture looks like a cross between a cot and a tent. Well, this unusual structure proved to be easy to set up. The cot is comfortable and the bars underneath are padded, and unlike other double camping cots, don’t seem to be a source of discomfort. The blurb tells us that the ‘elevated sleeping platform’ keeps you away from ‘bugs and snakes’. I never considered this to be the primary purpose of a raised bed especially as so many bugs and snakes can climb. Now, this may seem unfair, but if this camping cot claims to be a tent as well, it must be judged by its tent qualities. Some models provide a fly sheet. It is important to check this before buying. Though the fly sheet is easy to put up it causes some condensation. However, this can be mitigated by having the end flaps rolled up when you put the rain fly on, thereby allowing the built-in awnings to provide ventilation. Finally, as with most camping cots, the imperative of packing it into a small space means putting it back into its bag. Packing the cot back in its bag proved to be a bit of a challenge. Again, not a dealbreaker, just a minor bugbear. Every camper has known that deflated feeling of waking up with a mattress that has leaked air through the night. Well, the crucial word in the Insta-Bed Ez Queen Raised Air Mattress with NeverFlat is the last one. It was deemed too important to be spaced out between two words so the manufacturers converged into one: NeverFlat. The NeverFlat is a pump with a monitor which maintains the air pressure while you sleep. A solution to this perennial camper’s bugbear seems too good to be true. So I, along with some friends, had to put it to the test. This camping cot for two was a delight to sleep in. I made sure I had all my bedding and I have to say, it was as comfortable as my bed at home. This is serious glamping and one very comfortable camping cot. Lastly, when packed away, this double camping bed does take up an enormous amount of space. It’s worth checking this before buying and seeing if it fits in your car. They say that youth is about escaping the home and maturity is about finding it. As a general rule, the young are fleet of foot, and anxious to get away from the coddled and cosseted childhood lives and find adventure. On the other hand, the oldies want to carry on creating comfortable lives. So these contrasting outlooks made it hard for me to come up with a running order which encompasses the priorities of everyone. Just know that the five double camping cots listed in this article are all, in their own rights excellent camping cots. Choose one going on your personal preferences. The Coleman Airbed Cot with Side Table is a perfectly balanced package with nice little touches, I place this at number one. As a counterweight to that, I put the Disc-O-Bed Large with Organizers in at number two. Not all pairs of campers are married or otherwise romantically connected so I put these bunk beds in at number two. And this cot’s simplicity pays homage to the true spirit of camping. At number three The Kamp-Rite Tent Cot Double Kwik-Cot all-in-one tent and cot is also true to the spirit but was held back by the fact that it is primarily a tent. 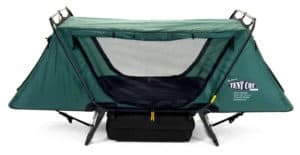 The tent’s qualities are outside the scope of this article but the tent/cot is a good product and worth considering. At number four, The Kamp-Rite Oversize Tent Cot, though ostensibly a double camping cot, felt like a single. This article is called The Best Double Camping Cot and I felt the Kamp-Rite Oversize Tent Cot pushed the definition of ‘double’ in the wrong direction. 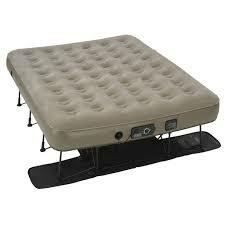 At number five I have put the Insta-Bed Ez Queen Raised Air Mattress with NeverFlat. This was the most comfortable camping cot of them all, and comfort is surely the most important criterion. 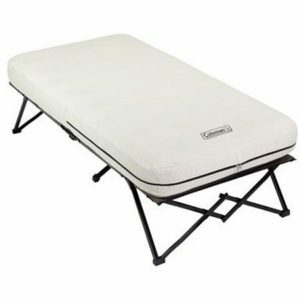 Well, it may be the most important but there are other aspects to consider and these flaws pulled this otherwise satisfying double camping bed into fifth place due to the early wear and tear signs. P.S. To go with your sumptuous double camping cot, why not treat yourself and your partner to a snug and warm double sleeping bag. We have reviewed our top 5 list on another article. Read it Here.